Last week , which released a PDF certificate as £27 DLC. Hadean Lands, from Boston-based indie developer Andrew Plotkin, is an interactive fiction game done in the old adventure game style. There are no graphics. You simply type your commands and read what happens next. 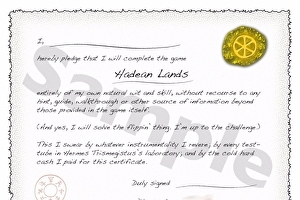 It’s important to note that Hadean Lands does not come with hints or a walkthrough, because that’s what this DLC revolves around. Next Next post: How will System Shock’s reboot differ from the original?